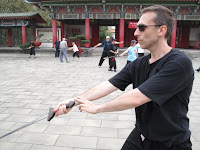 "Watching your Taijiquan videos it occurred to me to ask how you avoid "contaminating" your internal arts practice with your former karate experience, or vise versa. This was always a problem for me as I inadvertently "slipped" into Goju intent at the slightest similarity of movement. This was the prime reason why I returned fully to karate. Although a lot of what I experienced during that time has surfaced in my Goju practice." This was an interesting question. I couldn't think how to answer it, so I decided to pour myself a (very big) glass of red wine and "mull" it over. The red wine didn't help. I stood in the kitchen feeling progressively more and more inebriated but none the wiser. So I decided (as I often do) that it was probably best to write down the first thoughts that came into my mind. 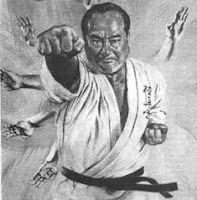 I recall the last time I trained with my goju teacher (who also started me on the Filipino and Chinese martial arts). 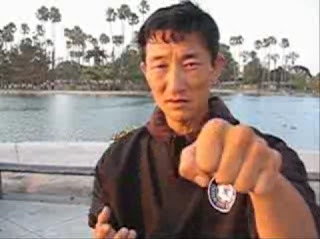 We were training in the dead of night - somewhere near 2 a.m., doing peng quan (splitting fist) from xingyiquan. Lao shi Bob (as we addressed him) was flying out the following day and we had to make the most of the available time. It was the last day of a mentally and physically exhausting 2 week visit. We had crammed in more than 10 hours of training per day for that entire time, but still it wasn't enough. I'd lost about 4 kg. 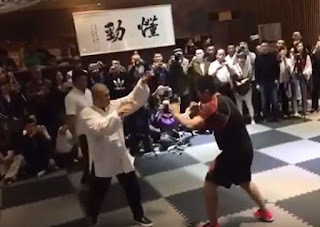 In the early hours of that particular morning he had us holding the finished position of peng quan (san ti - 3 heavens) as a standing posture for 20 minutes or so. He kept adjusting my hands with a heavy "tsk, tsk". No matter how hard I tried to follow his instructions he would keep shifting my hands this way and that. He'd turn his attention to my brother and then come back to me. "No - not hiki uke from karate. Your hands should be like THIS." And he would demonstrate. No sooner would he adjust my hands, than they would drift off line and he'd have to shove them back. The night was old, we were all tired and, dare I say it, cranky. 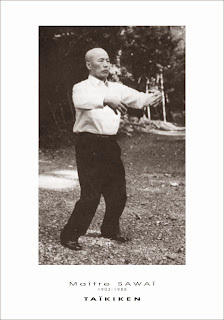 After he had exhausted the possibilities in correcting our hands he would go to the stance - zhan bu or "battle stance", xingyi's principle stance (sometimes called "rowing stance" and similar to an elongated "seisan dachi" or even the san zhan stance of yong chun white crane). "No - not kokutusu dachi from karate. Sheesh!" 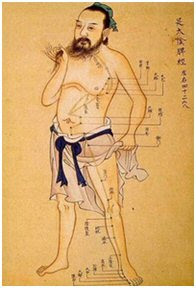 (Lao shi Bob's favourite exhortation was "sheesh!"). "Longer. Not THAT long. Now narrower. No - not SO narrow - one fist distance. No, no. It's looking like a kokutsu dachi again! And look at what's happened to your hands..."
When we finally left him that night I was utterly deflated. It seemed I was being asked to bridge an impossible chasm (for that is how one feels when all one's ready references are inappropriate). No matter how hard I tried, I could not "get it". Yet, more than a decade later, I reflect on the fact that pi quan now feels quite comfortable; familiar like one's favorite woolen jumper. What had happened in the intervening years to bridge this gulf? How was I able to divorce myself from the goju "paradigm" and make the internal arts one "my own"? Whatever it was, it wasn't something that happened easily. 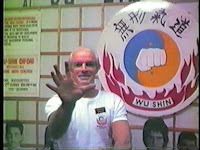 I recall my first trainings with my current teacher, Master Chen Yun-Ching. I remember him making similar adjustments, only with a different set of phrases from his limited English. "No beautiful!" he would shout as he slapped my hand into a different position. 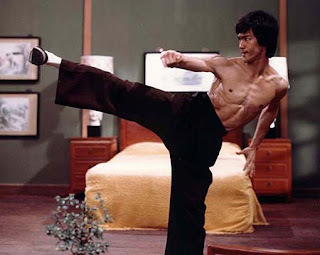 In particular I remember struggling with heng quan ("earth" or "crossing fist"). No matter how hard I tried it came out looking like a chudan uke (chest block) from karate. He would approach me with wide eyes and pursed lips - a look my own late father used when he was both incredulous and exasperated. Then there was the taijiquan. "No beautiful!" he would shout as he mimicked my stiff movements which contrasted with his own snake like fluidity (sometimes I caught the expression "bu hao" meaning "ugly") . 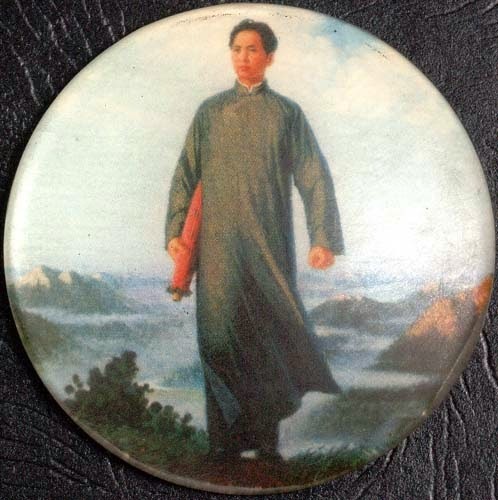 Despite years of training in the Yang style of taijiquan under Lao shi Bob, it seemed my karate was still "contaminating" my movement so that it did not match the "soft" movement that characterises taiji. At some point things changed. I remember at the end of one visit Master Chen praising me in front of the whole class. Through a translator he said that I had learned in the 4 days of that particular visit what he would normally expect a student to learn in one year. I was so elated that I felt like I was walking on a cloud. What had happened? How had I bridged the gap? I've kept writing this stream of consciousness hoping that the answer would come to me. And I think it just has. All this reminds me of what happens when you try to learn a new language. I have related how, in Taiwan, I went with our group photographer, Lucia Ondrusova, to visit an elderly calligrapher. In that account I described how how Lucia and I managed to communicate to each other in our respective mother tongues - Serb in my case, Slovak in Lucia's. This occasion, and watching a documentary in Slovak on Australia's SBS television network which I was occasionally startled to find myself understanding without having to read the subtitles, made me assume that the languages were sufficiently similar so that, should I choose to do so, I could absorb the Slovak and Czech languages with some "minor study". Some cursory research quickly revealed how wrong I was. The similarities (which are substantial) really serve as a double-edged sword. For example, as a Serb I would happily recognise words like "ako" (meaning "if" in Serbian) and assume they had a cognate meaning in Czech/Slovak. In fact, "ako" means "how" in the latter languages (where "how" in Serbian is "kako" while "if" in Czech/Slovak is "ak" not "ako"). The danger of misimpression is even greater when you consider that a word like "zavolem" in Czech/Slovak (to "call back") sounds an awful lot like "zavolim", which in Serbian means "to fall in love"! Terms that sound similar but have different meanings are known in linguistics as "false friends". More obvious examples to the English speaker can be found in French: These include such terms as “demande” which means to ask, not “demand”, and “opportunité” which means timeliness not “opportunity”. Individual words are, of course, just the beginning. One might also make incorrect assumptions about grammar, syntax and intonation. In respect of the latter, Serbian has borrowed from the Latin-based languages of the Mediterannean. When visiting the former Yugoslavia in 1990 my wife and I had dinner with my wife's childhood best friend and her husband, an Albanian Kosovar. Listening to him speak to his family I was struck by how similar the Albanian language "sounded" in relation to the Slavic Balkan languages. The words and grammar were largely unrelated, but the stresses fell on similar syllables making it sound like I "ought" to understand what they were saying. By contrast, the central and northern Slavic languages have a very different stress pattern, making them seem, at least initially, mutually unintelligible despite a very large common base in terms of vocabulary and grammar. For example, we Serbs would pronounce the name of the Russian composer "ShoSTAkovich". Russians of course say "ShostaKOvich". Czechs and Slovaks would say "SHOstakovich". And so it goes. Despite these kinds of similarities my late father was fluent not only in his native Serbian, but in Russian (as well as English and German, which are of course related to each other). I guess the point of this "stream of consciousness" analysis is this; learning a different martial art is quite like learning a new language; one will initially suffer the pitfalls of assuming that some familiar movement is, in fact, the same as that found in an earlier art one has studied. This assumption can be a major hurdle to progression. However it is not insurmountable. At first one will stumble at the hurdle. One will the probably negotiate one's way around it. Eventually one will learn the correct way to jump the hurdle. Of course, people have been learning new languages since time immemorial. My own father first began to learn English as a new migrant to Australia when he was 32. This was no easy task. For the purposes of his oral driver's licence exam he memorized the entire licence handbook by rote, even though he understood barely a single word. Yet by the time he was in his late 30s his engineering note books, initially meticulously written in his elegant Cyrillic script, had changed to English. When I read through them recently I could find virtually no errors in spelling or grammar. He had even mastered that which we Slavs find most difficult - the use of definite and indefinite articles ("the" and "a"). I know of many people who have learned to communicate in a new language at far more advanced ages than my father (perhaps not to the same degree of exactness that he achieved - but to a functional level nonetheless). This proves to me that even an "old dog" can learn new tricks. So the answer to the opening question is I suppose this: one must accept some element of "contamination" when one is learning a new martial art in addition to one's "base" art. However with enough effort this "contamination" will be limited to an "accent" - it will not affect the meaning and function of the new art. In this regard I suspect I will always be recognised as a "karate man", just as I will always be asked whether English is my native language (despite the fact that it is now the language I know best by far). However in the end I have no doubt that my accent does not detract from my ability to communicate effectively. I have every hope that the same applies to my studies of the internal arts (or any of the other arts I have chosen to examine in addition to karate). There are those who would confuse "accent" with "function". In the internal arts particularly there are many who note my "accent" and scoff. I remember attending one particular internal arts seminar where a student of a mere 12 months with whom I was paired began to lecture me on how to do a particular technique. His attitude was that my (then) 20 years of training amounted to nothing. I hadn't been doing the "real thing". What this person did not realise is this: with every language that you can speak, learning another becomes progressively easier (accent aside). Having a foundation in one gives you a "leg up" into the others. And with every language you acquire, the next becomes easier - particularly if they are similar. So it is with martial arts. I speak my native Serbian and English, but I was also (at one time) fluent in Afrikaans (a Dutch dialect spoken in South Africa). On the flight back to Australia from Taiwan I managed to converse quite well with a Dutch girl who was seated next to me. During our conversations I noted the same issues with "false friends" ("het" in Afrikaans means "had" but in Dutch it means "the"). I could see the issues, yet I could also see that at some point, with sufficient practise, I could become fluent in Dutch. My wife is Swiss German and was once fluent in her native dialect as well as High German (she's a bit out of practice nowadays). I have a basic level of German yet I can see that with a little practice I could become quite conversant. Yes, it might be challenging to learn a new language - especially with the "false friends" I have referred to above. However this is not nearly as challenging as learning a language as an adult when you have grown up not speaking any language at all (which regrettably has happened in history). In the context of this analogy, the internal arts student criticizing me was a mature-age beginner in the martial arts. He had grown up without any "martial language". His only experience comprised the taiji he had learned in the preceding year. This could not compare remotely with my 20 years experience in at least 5 different Japanese, Okinawan, Chinese and Filipino arts - some of which I had commenced when I was still in my formative years. I merely nodded and accepted his criticism. He was confusing my martial "accent" for lack of knowledge, in much the same way that people sometimes assume that my English is not going to be up to par because of the way I sound. 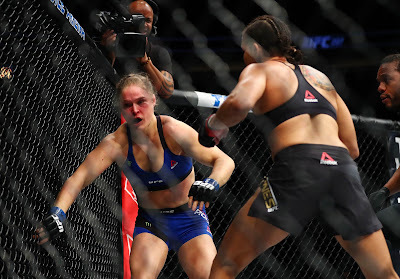 "Accent elitism" and snobbery are all too common in the martial arts. 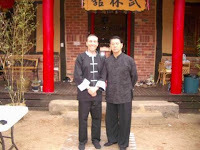 I am fortunate that my teacher Chen Shifu sees past "accent". After almost 30 years in the martial arts it is, I guess, unsurprising that I should learn in 4 days what he teaches raw beginners in one year. Had this not been the case I should be wondering what I have been doing for all this time. 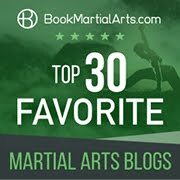 To a certain extent, I think that each art contains a subset of some whole that comprises the effective martial techniques that can be executed by a human. Given that premise, learning multiple arts is just coming at the same material from a different angle. Ultimately, the arts can merge, at least to some extent. Obviously, this depends on how similar the arts are. I personally currently practice kenjutsu, Destreza, and kali, all of which are fundamentally fairly similar. The biggest difference between them is the style of weapons used, which makes transitioning from one to another fairly easy - pick up a weapon, and choose the style that fits it best. Given a pairing like taijiquan and karate, which cover the same territory (unarmed combat) from diametrically opposed viewpoints, it's naturally going to be significantly harder to reconcile them, but given enough work, it seems to me that the softness and structure of taiji could be a valuable supplement to karate, while the aggressive techniques of karate might be a useful addition to taiji (from a combat point of view, anyway). Well said Aaron. I couldn't agree more. I found your analogy of languages and accent fascinating. I've often used a similar one to explain the relationship of different martial arts or styles, mainly to non-martial artists. 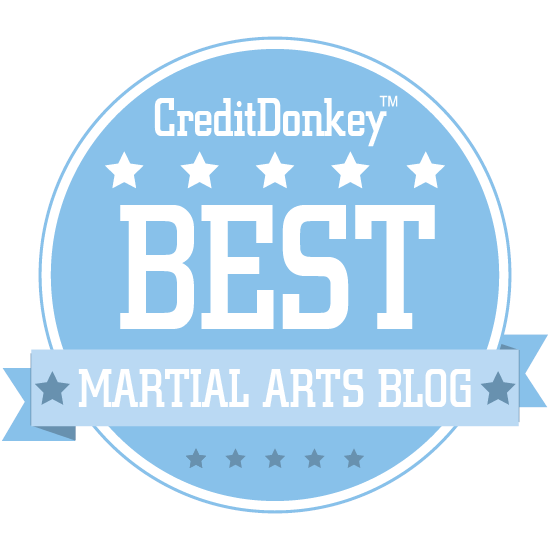 After reading your blog, i've realised that the analogy works so well perhaps because martial arts are in their own right a form of language, albeit a physical one. Another elegant post Dan! Your comments about language resonates more so with me now working in the environment that I am working in. There are artists from 10 different countries here at Cirque Macau so as you can imagine, it is an interesting work place! Look forward to reading more and seeing you again in August.